From email to Hangouts to a good ol' fashioned phone call, you've got a lot of options to get in touch with someone. But keeping all those options organized for all your contacts...well, it can be a pain, especially when you need to find that information in a hurry! So today we’re releasing a preview of the new Google Contacts that makes it easier to keep track of the people you know and get the info you need, fast. 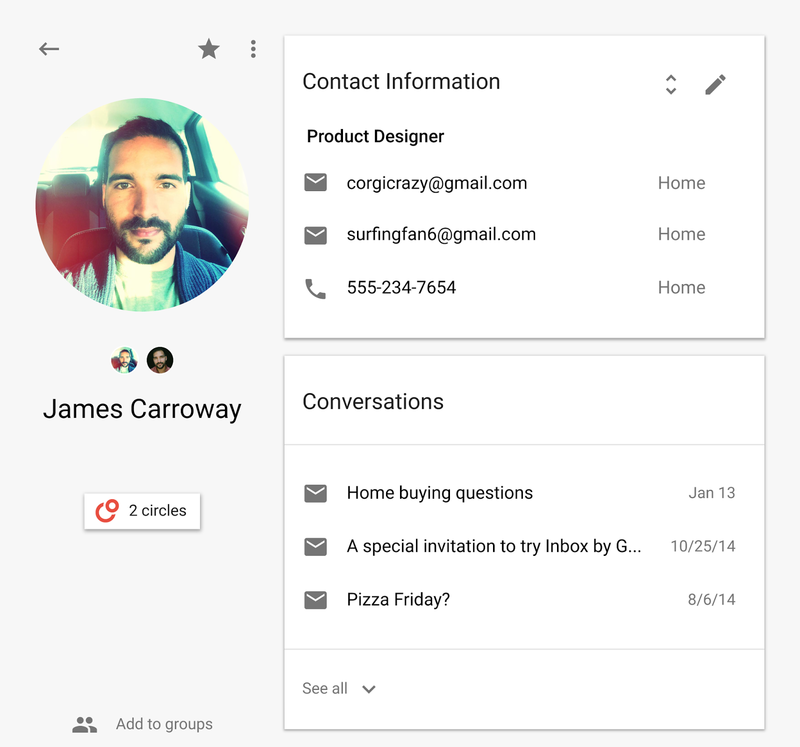 The new Google Contacts comes with a fresh look and feel, and conveniently pools together all your contacts, circles, and the people you talk to most in Gmail. No one likes having duplicate contacts, but they inevitably crop up. So we’ve rebuilt our “Find duplicates” feature from the ground up to help give you a quick and painless way to clean up your duplicates. As the people you know change jobs, cities, and names, it can be tough to stay up to date with their latest information. The new Contacts ensures that the info you see is still accurate and ready to use by blending your contact’s Google profile information with the stuff you already have. 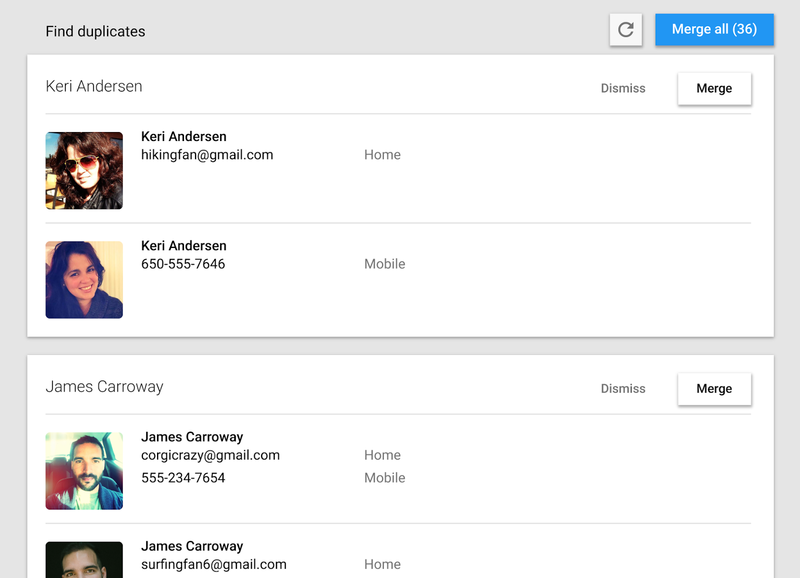 Finally, you can now see your most recent emails and meetings with a person directly in their contact card. So whether it’s been two days or two years since your last conversation, it’s easier than ever to pick up right where you left off. For people looking to access the preview through Gmail, keep an eye out over the next few weeks. In the meantime, you can try the new Google Contacts today by visiting contacts.google.com/preview. P.S. 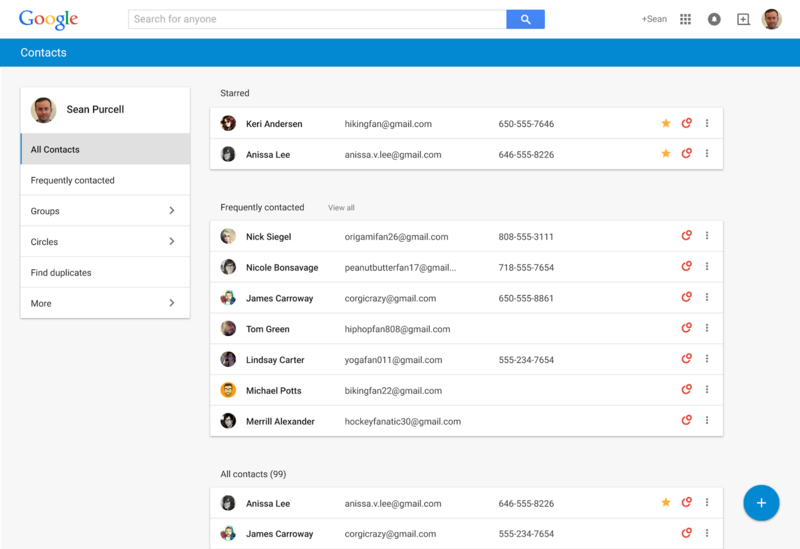 The new Contacts isn’t yet available for Google Apps customers, but we’re working on it.